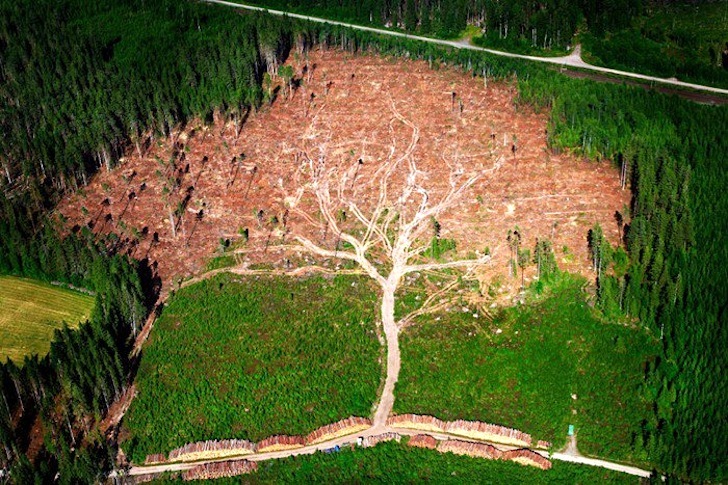 In January 2005, a terrible hurricane-force storm swept through Sweden, felling 75,000,000 cubic meters of forest in its wake. Called Gudrun, this monster was even more destructive than the Derecho that left millions of Americans without power last week. After officials cleared this particular patch of pine trees in southern Sweden, a magnificent pattern of a giant tree emerged. Photographer Joakim Berglund captured the moment in this awesome photograph, which went on to win Sweden’s annual press photography awards in 2006. All these years later, Berglund’s powerful image continues to underscore Mother Nature’s potential for both extraordinary beauty and terror. Prints are available for purchase at the London Natural History Museum. In January 2005, a terrible hurricane-force storm swept through Sweden, felling 75,000,000 cubic meters of forest in its wake. Called Gudrun, this monster was even more destructive than the Derecho that left millions of Americans without power last week. After officials cleared this particular patch of pine trees in southern Sweden, a magnificent pattern of a giant tree emerged. Photographer Joakim Berglund captured the moment in this awesome photograph, which went on to win Sweden's annual press photography awards in 2006. All these years later, Berglund's powerful image continues to underscore Mother Nature's potential for both extraordinary beauty and terror. Prints are available for purchase at the London Natural History Museum.